Today is the feast of the newly canonized (2012) Saint Catherine Tekakwitha. 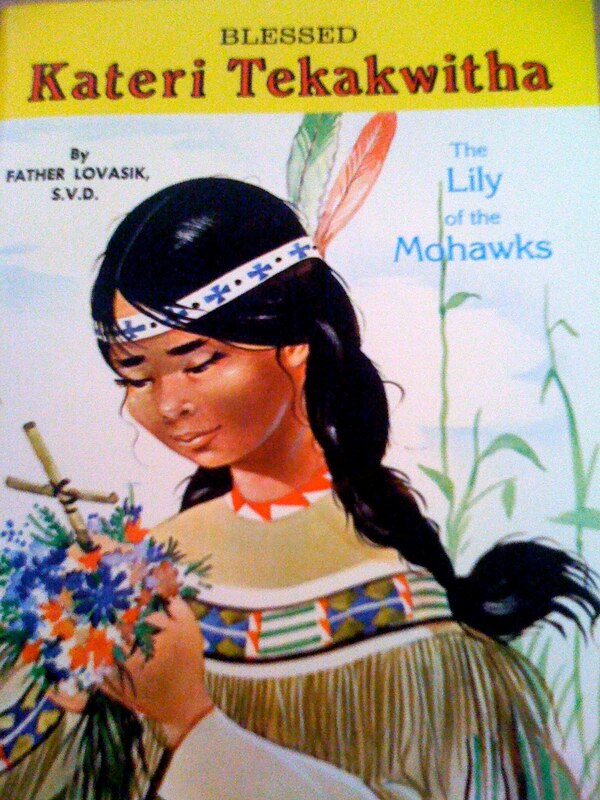 In much of this post I’m relying for the historical facts and some of the theoretical discussion upon the excellent book Mohawk Saint: Catherine Tekakwitha and the Jesuits by the Canadian historian Allan Greer. Most striking to me as a theologian in encountering Tekakwitha Catherine (more on the naming in a moment) is the strangeness of her holiness, and the mystery of her discipleship under layers and layers of interpretation, appropriation, and exploitation. To paraphrase Churchill, she is a saint, wrapped in a mystery, inside an enigma, but that very paradox may help us break open our ideas of holiness and save us, as she saved a 17th century Jesuit named Claude Chauchetière, from our own ideas of holiness. It’s difficult to do justice to either Tekakwitha or Greer’s book in one short essay, so I’ll be making three major points: about her name, about those who have claimed her, and about her piety and holiness. 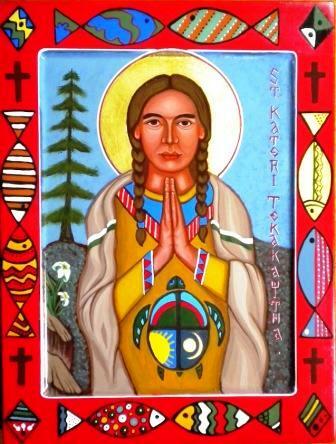 Knowing a little bit about the “historical Catherine Tekakwitha” rather than the mythologized Kateri is a good start. She was born sometime around 1656 into a Mohawk community at Gandaouagué, near Auriesville, New York. She was baptized in young adulthood, on Easter Sunday, 1676, as part of a wave of Mohawk adoptions of Christianity. In 1677 she moved north to the explicitly Christian Indian village of Kahnawake, just outside of Montreal. On April 17th, 1680 – Holy Thursday of that year – Tekakwitha Catherine died at the age of 24. “Nelly Walworth, anxious to eliminate the blatantly European ‘Catherine’ from her title [of her book], was using a Mohawk mispronunciation of an Italian saint’s name, linked to a French approximation of a Mohawk name, to clothe her heroine in an identity designed to look immaculately aboriginal. The gambit was a complete success; ever since, Tekakwitha/Catherine has been known around the world as ‘Kateri Tekakwitha.’” (Greer, 197). But not all around the world – the Latin form used at her canonization in 2012 was “Catharina”; the question of to whom “our Catherine” belongs, given the widespread veneration of Kateri by U.S. Native Americans, especially in the Southwest (but not so much by Canadian Mohawks…), only begins to scratch the surface of this complexity. To whom does Tekakwitha “belong”? Whose version of Catherine ought to be our model? That of the mostly female, and mostly silent, Iroquois companions with whom she created a kind of intensive spiritual society in the midst of a Native village during a time of war and crisis? These women lived, worked, prayed, and mortified themselves together over a period of years, co-creating a uniquely hybrid Iroquois Christianity, yet we know them only through the distinctive lenses of their Jesuit advisors – and sometimes adversaries. To Fr. Claude Chauchetière, S.J., a rather excitable Jesuit who encountered her upon her deathbed? Chauchetière was convinced of her holiness, perhaps even converted to his mission in New France and to the possibility of holiness among les sauvages by the encounter, and was one of the first promoters of her cause. To Fr. Pierre Cholenoc, S.J., Chauchetière’s more pragmatic confrère as well as Tekakwitha’s confessor during her time at Kahnawake? 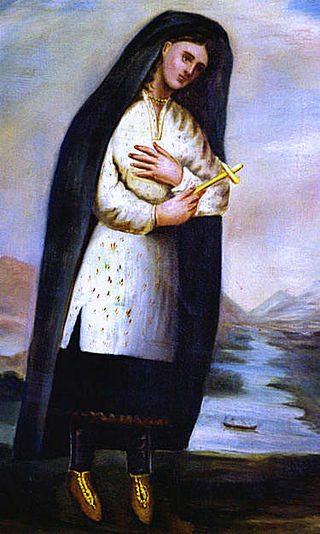 Cholenoc wrote the first “official” hagiography of Catherine (which first appeared in book form in Spanish, in Mexico City, to promote the possibility of the admission of indias to religious life). To the French habitants who quickly established Tekakwitha’s post-mortem power as an intercessor, especially the numerous women who invoked this virgin for problems related to pregnancy? Shortly after her death, Tekawitha’s cult took off among the French Canadiens, while her fellow Iroquois honored her memory without seeming to take much interest in appealing to her for intercessory cures. To the U.S. Bishops at the Third Plenary Council of Baltimore (1884), who petitioned the Vatican for Tekakwitha’s beatification? Greer suggests this be understood as an attempt to find a “nationalist icon” that would simultaneously root Catholicism in U.S. soil and provide a countersymbol against nativist anti-Catholic prejudices. Which leaves open the question of which shrine of St. Katherine Tekakwitha is the “best” – the American shrine in upstate New York, conveniently located near the site of the martyrdoms of Isaac Jogues and Jean de Brébeuf, or the Canadian shrine at Kahnawake – itself located within sovereign Mohawk territory? 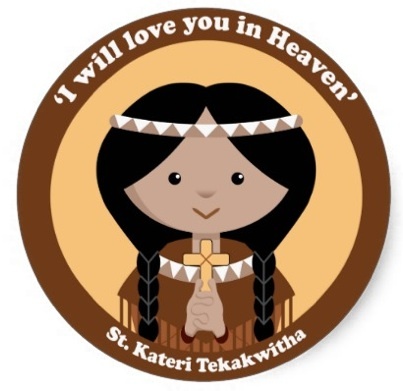 To the U.S.-wide Tekakwitha Conference in the United States, an organization of Native American Catholics claiming their identity as Catholic and indigenous under the banner of St. Kateri? To the contemporary Roman Catholic church, whose collect for today seems to utilize Catherine as a model for reconciled unity-in-diversity? But to do so, it seems to me, would be to betray Tekakwitha Catherine once again in an image and a narrative of our own creation, just as has been done so many times in the past. Having spent the last week reading and meditating upon her life, I am left more confused and less sure about what to say about her than before. And yet that might be the blessing of this feast – to honor not only the memory and intercession of Catherine Tekakwitha, but to let our reaction, even revulsion, at what to us seems strange about her, and our own ignorance about the mystery of who she is, to push us into greater awareness of the strangeness of holiness in general, of the God whose ways are not our ways, and our ignorance of the mystery of the Son through whom we know something about God – but not everything. If we must attempt to appropriate Tekakwitha in 2014, as we will try to do whether we want to or not, then we might do well to let our encounter with her as a strange and holy mystery remind us of the strangeness of the Holy One, and warn us against our attempts to domesticate the Mystery of the God Tekakwitha Catherine found in 1676. Great article. Couple of thoughts. 1 I think there is a sense, for me at least, that many of the saints (not just Kateri) are voids into which we project all of our spiritual and political projects.